¤ The legendary cult heroine Rickie Lee Jones returns with her latest outing The Devil You Know, a surprising and fascinating collection of covers produced by famed musician (and longtime fan) BEN HARPER. 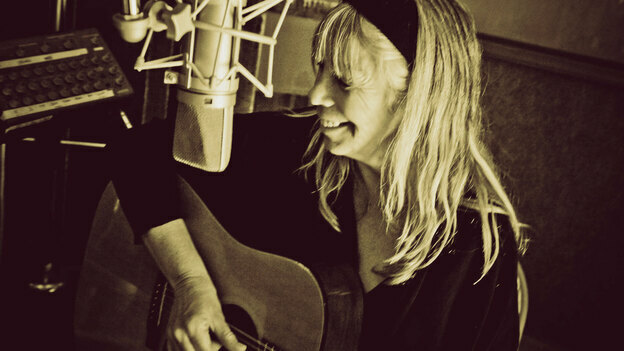 ¤ "It's a simple, surprising record,” says Rickie Lee Jones of her new album, The Devil You Know. ¤ Though she’s one of the most acclaimed singer-songwriters of our time, interpretive singing has long been part of Jones’s musical tapestry as well. Such previous collections as Girl at Her Volcano (1983), Pop Pop (1991), and It’s Like This (2000) have illustrated the fresh and inimitable feel that she has for classic American compositions; she won a Grammy for her sly duet with Dr. John on the naughty-but-nice standard “Makin’ Whoopee” and was nominated for another for her performance of "Autumn Leaves" with bassist Rob Wasserman. ¤ With The Devil You Know, Jones turns her focus to the rock & roll canon that shaped a generation. She tackles the work of such giants as Neil Young (“Only Love Can Break Your Heart”), The Band (“The Weight”), and Van Morrison (“Comfort You”). Though these songs are burned deeply into our brains, Jones finds her own unique way in, peeling them back with spare, intimate arrangements, and uncovering layers and emotions that feel both familiar and new. ¤ Her version of “Sympathy for the Devil,” which she first performed at a Rolling Stones tribute concert at Carnegie Hall, perhaps best represents her approach. “It’s voodoo,” she says. “It's a woman embodying a man embodying the devil—or is it the other way around?" ¤ Jones created the album with the assistance of another Grammy winner, acclaimed folk-soul-rocker Ben Harper, who produced and plays on nearly every track, and contributed the album’s lone new song, “Masterpiece,” a ballad he could picture only Jones singing. Harper appeared on Jones's last album, Balm in Gilead. ¤ While some singers might be intimidated by the enormity of this material, Rickie Lee Jones has made a career of fearlessly experimenting with her sound and her persona. Her unforgettable 1979 debut landed her two Rolling Stone covers in two years, and elements of her image were absorbed into the culture, from the Chuck E. Cheese pizza chain to the interest in jazz and signature costume (fingerless gloves, spandex, hat) from so many female pop singers who followed. ¤ September 22, 2012 — It takes chutzpah to redo the kind of songs that get labeled as iconic, like The Rolling Stones' "Sympathy for the Devil," or "The Weight' by The Band, or Neil Young's "Only Love Can Break Your Heart." 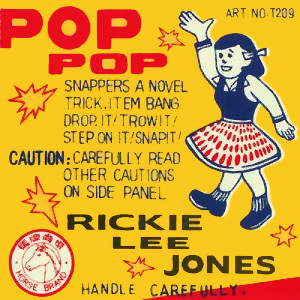 But Rickie Lee Jones has made a career out of surprising people. She takes on these iconic tracks fearlessly and never disappoints. ¤ With Ben Harper as producer, Jones reinterpreted 10 tunes for her new album, The Devil You Know, that appear on many people's "Best Of" lists. She recently sat down with NPR's Scott Simon to discuss her newest project and life on the road. She also performs two songs from the new album. ¤ "When I started out, there was this kind of glamour associated with singer-songwriterdom that wasn't being given to just singers. So I think [I recorded the album] partially to remind people that a singer is the one who interprets the song. And once you do that, it's yours. To me, it doesn't make it more mine because I wrote it; it comes alive in the heart and voice of some other interpreter." ¤ "I was invited to do a Rolling Stones tribute at Carnegie Hall. I had to think of a song, and I just started playing that on the acoustic guitar. It was clear that that part and that aspect of that song had never been explored — just raw, one devil with one guitar. ¤ "It's kind of an evocation, and I do it by myself. It's a powerful, frightening, fun romp through the upper echelon of hell. Every time I do it so far, it's like acting — some other thing you can embody and wear the skin of another thing, and tell another kind of story than your own. I like it." ¤ "[It] must be when I'm on stage and I'm in the river of it. There's a little bit of fear, but it's not so much that it's fear — it's excitement. Sometimes I press that down. When I don't press that down and go ahead and be there in the surreal of it all and get taken up in [the audience], there's nothing like this. Maybe a reverend in a church, maybe it happens. I don't know, but it's pretty wondrous." ¤ Rickie Lee Jones' The Devil You Know is a collection of classic rock cover songs that follows the intimate — and excellent — Balm in Gilead. Jones has performed covers since she began singing in dive bars in Los Angeles in the 1970s. They've made steady appearances in her recording career: Girl at Her Volcano (1983), Pop Pop in 1991, and It’s Like This (2000). Jones is a truly gifted interpreter. She takes songs inside herself, pulls them apart, reveals previously hidden meanings, and imbues them with new shades of meaning while transforming them into something of her own. Ben Harper, who collaborated with her on Balm in Gilead, produced the set. He gets it exactly right: the instrumentation is sparse, leaving lots of space for Jones' voice at the forefront. Ultimately, The Devil You Know is about Jones' voice and the journey it takes through these songs. So intimate are these proceedings, the listener may feel she is eavesdropping. In Jones' voice, "Sympathy for the Devil" is no longer a swaggering statement of rebellion, but an exposed view of the heart of the being who boasts. Neil Young's "Only Love Can Break Your Heart" sheds the innocence of the original and imparts experience, wisdom, and scars from love's battlefield without bitterness or cynicism, only tenderness. Her reading of Van Morrison's "Comfort You" is proof. She takes the songwriter's sense of want and expresses it as a pure intention in spite of its cost. The two seeming oddities here — Harper's original "Masterpiece" and the standard "St. James Infirmary" — add striking depth and dimension. The former is obviously modeled on Morrison's Astral Weeks period and as such, Jones gives it that anchor. Her take on the latter tune strips away the decades of nostalgia and brings it right back to the blues. Her emotive resonance brings back the depth of emotion the song was meant to convey. Jones' version of Tim Hardin's "Reason to Believe" and Ted Anderson's "Seems Like a Long Time" both appeared on Rod Stewart's Every Picture Tells a Story. Jones adds a different kind of authority to both. Her voice, while less grainy, is more world-weary, more broken, but more convincing in its resolve. Between them is the Rolling Stones' "Play with Fire," its refrain is a warning (once more stripped of its boast), an act of simple, dark truth-telling. With its restrained arrangements and spacious production, The Devil You Know allows Jones' enigmatic voice the room it needs to rise and deliver these songs, not from rock & roll history, but from her heart, marrow, and bones. Rickie Lee Jones' new album, The Devil You Know, is a collection of covers. "I think [I recorded the album] partially to remind people that a singer is the one who interprets the song," she says. "And once you do that, it's yours."